If lead ammunition is bad for the environment, why do we still use it? Andrea Goodnight knows firsthand what lead poisoning looks like. A veterinarian at the Oakland Zoo, Goodnight treats endangered California condors when testing shows dangerous levels of the toxic metal in their blood. Ammunition is the main source of lead that poisons condors. 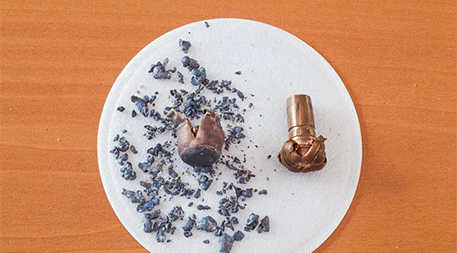 Lead’s availability, density and malleability have made it a cost-effective bullet material for centuries. But lead bullets can lose half of their mass on impact, leaving hundreds of tiny fragments both in the meat hunters take home and the entrails they leave behind, which are a food source for many wild creatures. Before California outlawed lead ammunition in its eight-county condor range in 2008, hunters there left behind more than 30,000 lead-tainted carcasses or “gut piles” each year, according to a 2003 study. A 2009 review of the scientific literature found more than 130 species of animals known to have been exposed to or killed by lead from ingesting it or eating lead-tainted meat. Pointing to a growing body of research that links it to wildlife deaths and suggests it’s a threat to people who eat wild game, some scientists say it’s time to phase out lead ammunition in favor of non-toxic alternatives. But gun rights advocates have largely beaten back attempts to regulate lead by dismissing the science and stoking suspicions that what lead ammunition opponents have in their crosshairs is not lead, but hunting altogether. Many hunters are voluntarily switching to lead-free ammunition, and others would do the same if they fully understood the risk to wildlife and to their own families, says Leland Brown, a non-lead hunting educator with the Oregon Zoo. But he says the hunting community as a whole often feels unfairly attacked by environmental groups and underappreciated for its conservation ethic. A U.S.-wide ban on hunting waterfowl with lead was instituted in 1991 after scientists estimated that 2 million waterfowl a year were dying from eating lead shot while scooping up food from the bottoms of lakes and streams or ingesting pebbles to grind food in their gizzards. In 2013 California approved a statewide ban on lead ammunition that began with certain types of hunting in 2015 and will apply to all hunting beginning July 1, 2019. Minnesota officials are considering a ban on small-game hunting with lead in some parts of the state, and 34 states in addition to California have regulations that go beyond the federal waterfowl ban. But in most states and for most types of hunting, lead remains the go-to material. The U.S. is not atypical in having a patchwork of lead regulations. Canada requires hunters to use non-lead shotgun pellets in wetlands and national wildlife areas and for hunting most migratory birds. Lead shot is outlawed in Denmark, the Netherlands and the Flemish region of Belgium. Several other European Union members have instituted or are considering bans on hunting waterfowl with lead, but the EU has no legislation restricting its use. Norway in 2005 adopted a nationwide ban on hunting with lead but its parliament in 2015repealed the ban outside of wetlands, saying there was insufficient evidence to support it. Lead poisoning causes brain damage and, in humans, is thought to be linked with lower IQ, poor school performance and violent behavior. Even the ancient Romans knew lead could cause cognitive damage and death. “Indeed, we know more about the toxicity of lead than we do about almost any other contaminant,” says Myra Finkelstein, an environmental toxicologist at the University of California, Santa Cruz who studies lead’s effects on wildlife. The emblematic animal victim of lead poisoning, the California condor, was brought back from the brink of extinction through a captive breeding program begun in the 1980s. There are now over 400 condors in California, Arizona and Mexico’s Baja California peninsula, with more than half of them wild and the rest in captivity. A 2012 study by Finkelstein and colleagues noted that, each year, one in five free-flying birds has blood lead levels high enough to require treatment; lead poisoning is responsible for more than half of condor deaths. Finkelstein’s research showed that the regional lead ban in the condor range was ineffective in protecting the wide-ranging birds. The study found that “the prevalence of lead poisoning in California condors is of epidemic proportion” and used isotope “fingerprinting” to demonstrate that lead ammunition is the main source. The scientists concluded that only eliminating or substantially reducing lead poisoning rates could bring about a real recovery of condors. Environmentalists say the science is clear and have twice petitioned the U.S. Environmental Protection Agency to regulate lead ammunition nationwide under the Toxic Substances Control Act. The EPA rejected the petitions, saying its hands are tied because of an exemption in TSCA for ammunition. When the groups sued EPA, federal district and appeals courts sided with the agency. “It’s a crazy situation where we can’t use our toxic substance law for exactly what it’s designed for,” says Jeff Miller, conservation advocate with the Center for Biological Diversity, one of the groups calling for federal regulation of lead ammo. While Miller says the center will continue pursuing other avenues to bring about federal regulation, gun rights advocates appear to be winning the legislative battle over what they call “traditional” ammunition. The National Rifle Association has pushed bills that would block EPA from regulating lead ammunition under TSCA, and the group won a significant victory last year when President Barack Obama signed a defense bill that does just that. “I have to finally, actually acknowledge that, at least on that round, the NRA won,” says William Snape, senior counsel with the Center for Biological Diversity. And Snape said he’s even more concerned about proposed language in a federal spending bill that would permanently blockthe agency from regulating lead ammunition and fishing tackle not only under TSCA, but any other law. “We’re very worried that some of this language could find its way into a deal,” he says. The NRA did not respond to requests for comment on this story. Its lobbying arm has contended that “anti-lead ammunition advocates want to ban all lead ammunition both at ranges and in the field, and they want to ban all hunting,” but the Humane Society of the United States policy statement the NRA points to only targets certain types of hunting, including bear baiting, contest killing, and trophy hunting of rare and endangered animals. NSSF also claims that a 2008 U.S. Centers for Disease Control and Prevention study of hunters and others in North Dakota who regularly eat wild game confirms there is no health risk from eating animals killed with lead, noting that none of the 736 participants had a blood lead level higher than the threshold at which the CDC recommends a health intervention. But the group’s conclusion ignores the study’s broader finding that those who ate a lot of wild game tended to have higher blood lead levels than those who ate little or none, and the levels were higher the more recently the person had eaten wild game. NSSF reached and promoted a starkly different interpretation of the study than the North Dakota Department of Health, which reacted by issuing recommendations that pregnant women and children under six years old avoid eating venison shot with lead bullets. Furthermore, the CDC has since cut in half the blood lead level at which it recommends a public health intervention to counteract lead poisoning, putting several study participants above today’s threshold. The agency warns there is no safe blood lead level in children. The North Dakota study was prompted by independent research by a physician and hunter who found lead fragments in venison donated to food pantries. NSSF and other critics noted that the physician, William Cornatzer, sat on the board of directors of the Peregrine Fund, a leading group in efforts to protect condors from lead and other threats. But the findings — coming on the heels of a study that found lead in a quarter of venison samples from Minnesota food banks — convinced North Dakota officials to order the charities to throw out venison and only accept donations from bow hunters. While some lead-free ammunition costs twice as much as mass-market lead brands, non-lead bullets are comparable in price to premium lead ammunition, and can even be cheaper, according to the not-for-profit Institute for Wildlife Studies, which runs awebsite with information for hunters interested in switching to lead-free ammunition. The group says ammunition is typically among the smallest costs associated with hunting. A 2013 study found little difference in price when comparing premium lead ammunition and nontoxic alternatives, and concluded that hunters who use lead-free options do not sacrifice performance. Even the NRA has praised the performance of copper bullets. And prices for non-lead bullets continue to fall. Federal Ammunition, for example, recently released a copper bullet under its budget Power Shok line, which Cabela’s sells in the popular .30-06 caliber for US$27.99 for a box of 20 rounds. Some Federal premium lead cartridges in the same caliber retail at US$24.99, while other premium lead bullets go for US$40.99 a box. Similarly, research has shown that — despite many hunters’ feelings to the contrary — nontoxic steel shotgun pellets are just as effective as lead shot at killing mourning doves, the nation’s most popular game bird. Prices vary, but Cabela’s sells 12-gauge Kent #6 steel shot for US$13.99 per box, while the same company’s premier lead shotgun shells in the same gauge and shot size range from US$12.99 to US$14.99. Brown, from the Oregon Zoo, says non-lead bullets work better than lead bullets, because they cut deep into the animal’s body and bring it down quickly. He made the switch after learning how much lead bullets fragment on impact.